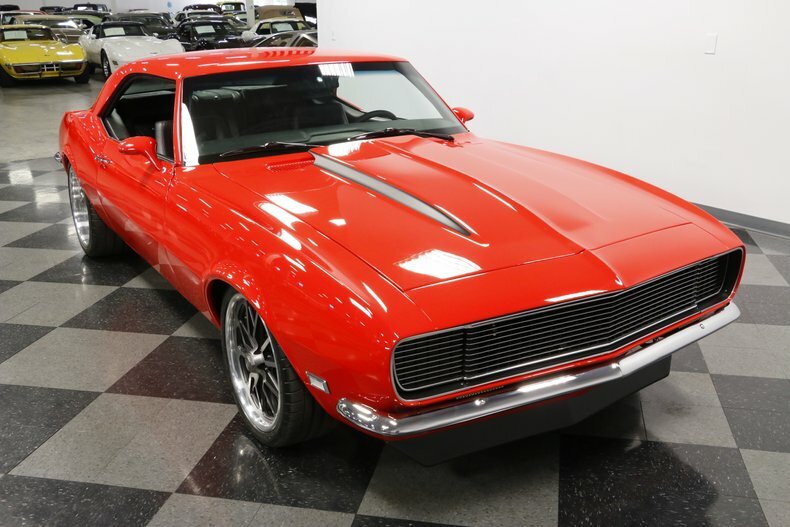 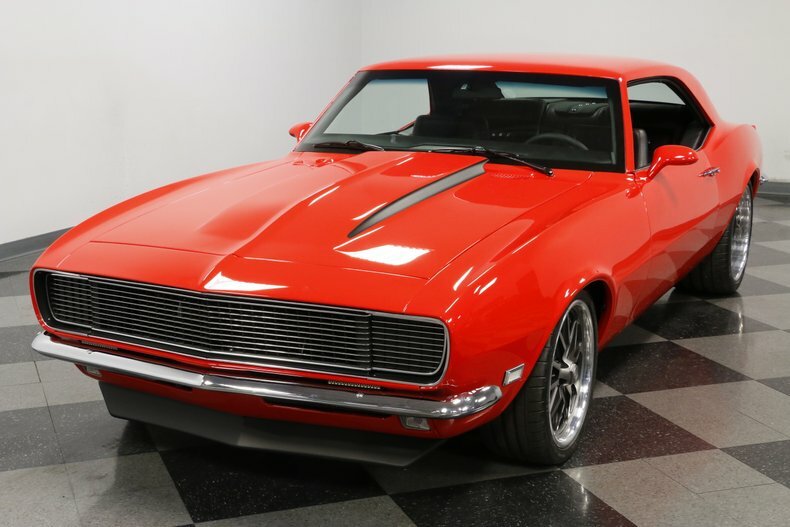 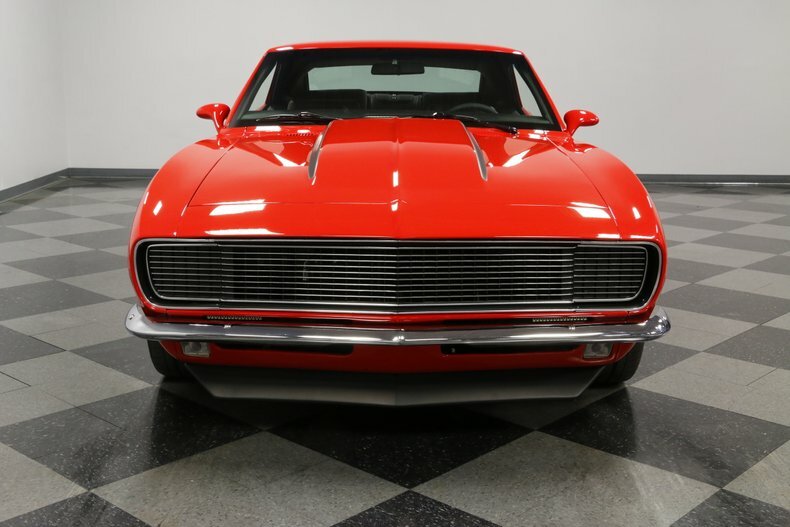 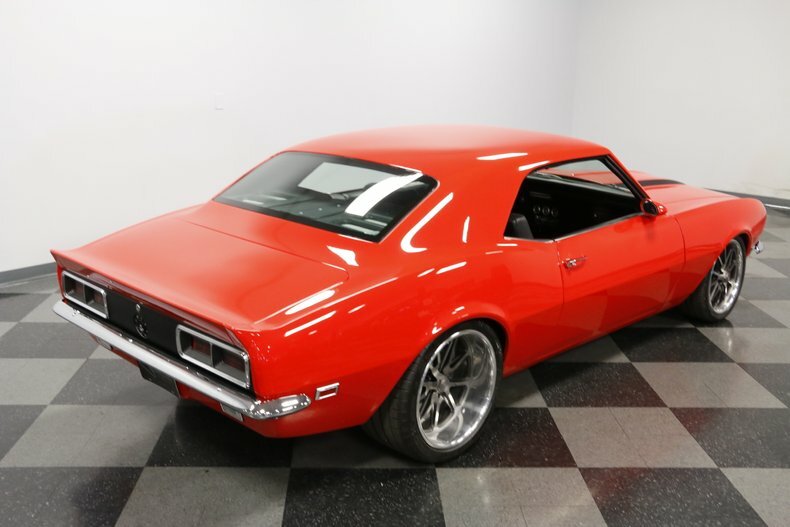 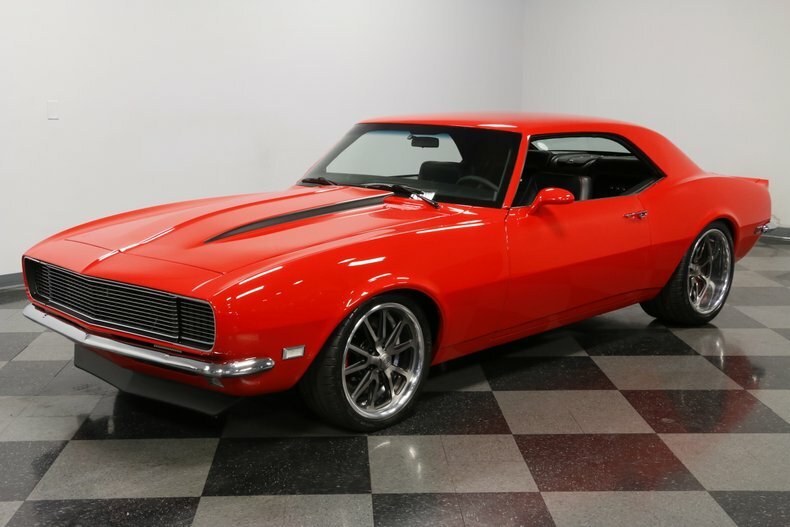 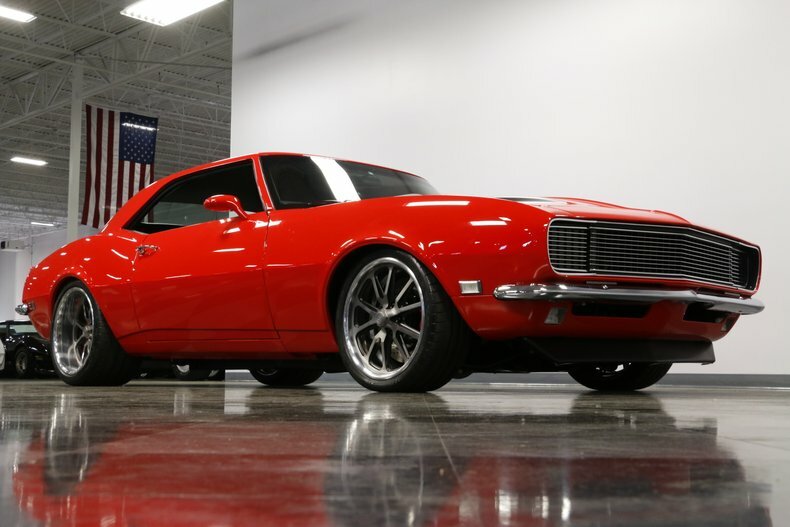 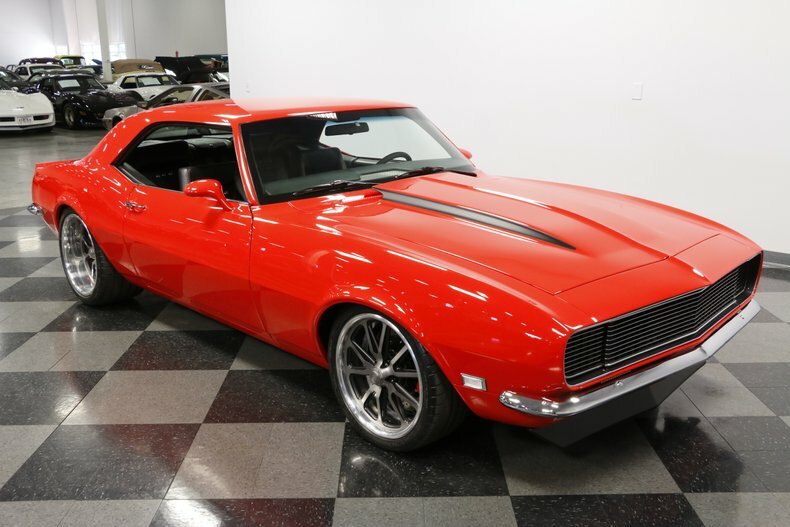 You can call this 1968 Chevrolet Camaro RS pro touring or a resto mod...Labels don't matter when you play at this premium level of fuel-injected V8 power, modern upgrades, and the slickest custom you're ever going to see. 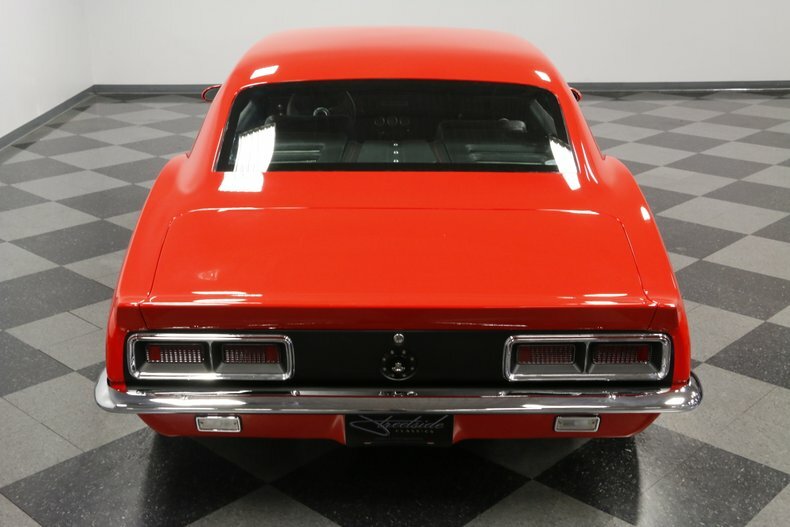 Before we let you admire the paint, take a moment to look over the body. 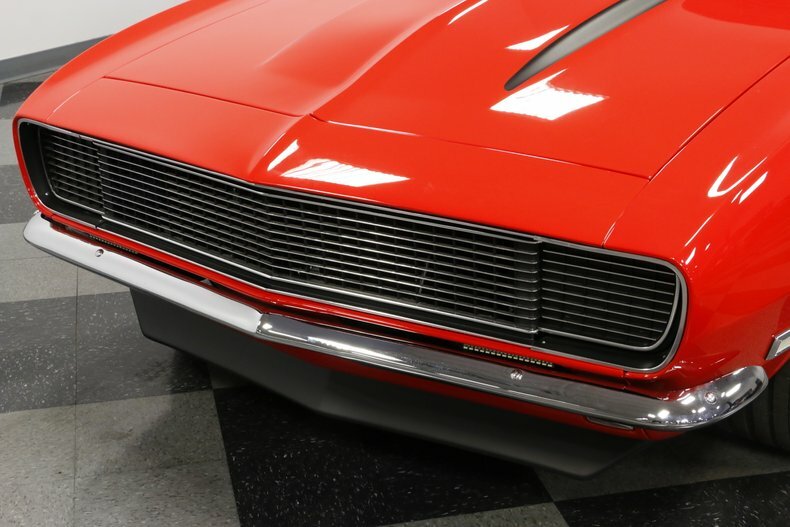 It seems a bit more modern than other first-gen Camaros you see, right? 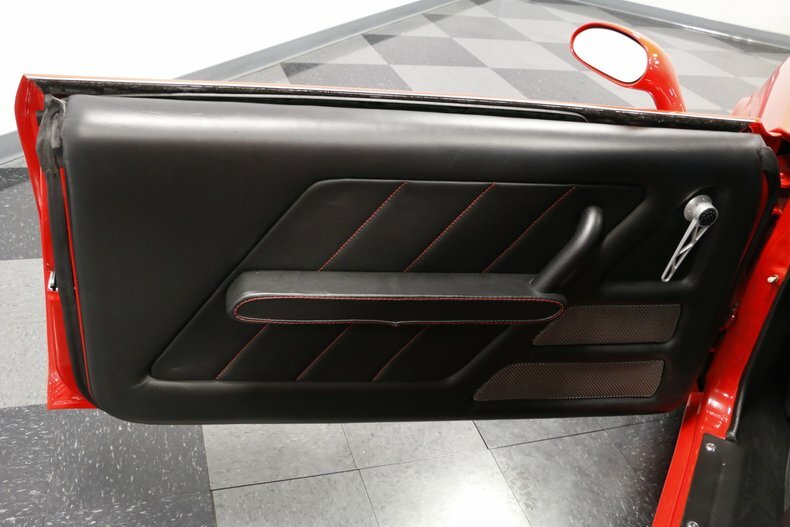 That's because they really sweated the details. 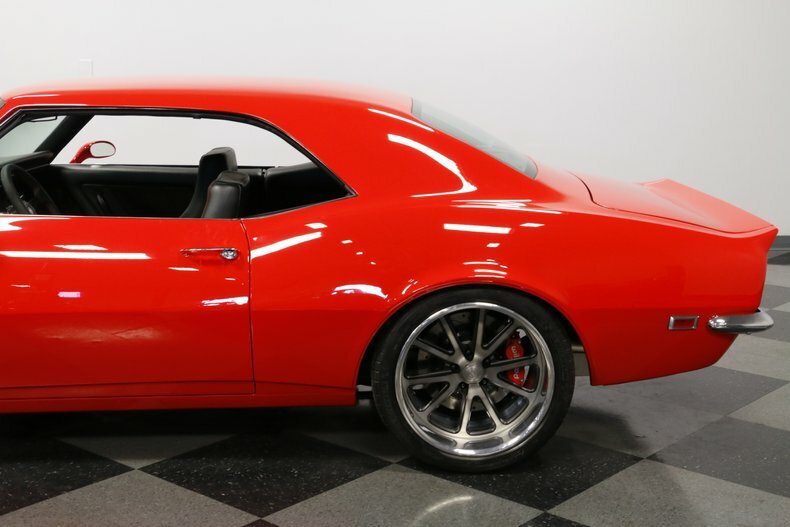 Drip rails were eliminated, sport mirrors were added, the windshield and rear glass was flush-mounted, and the fenders were delicately flared to accommodate the 10-spoke US Mags wheels. 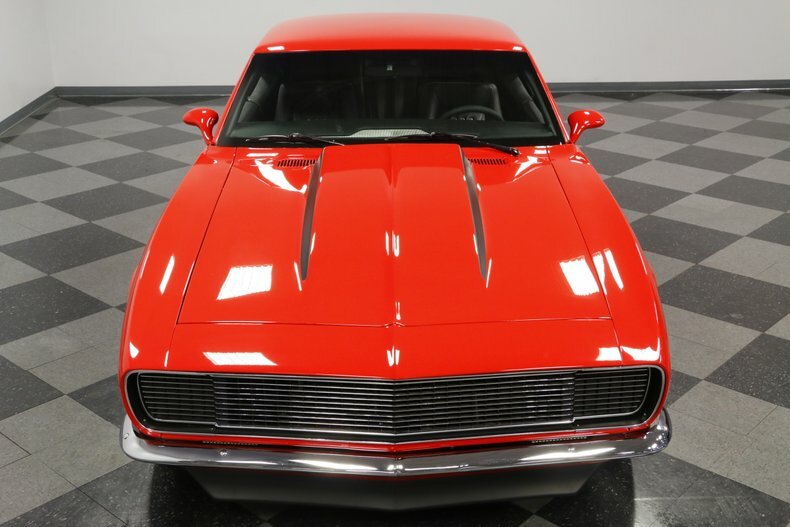 It was all to make sure this had the most seamless appearance of any '68 you've ever seen. 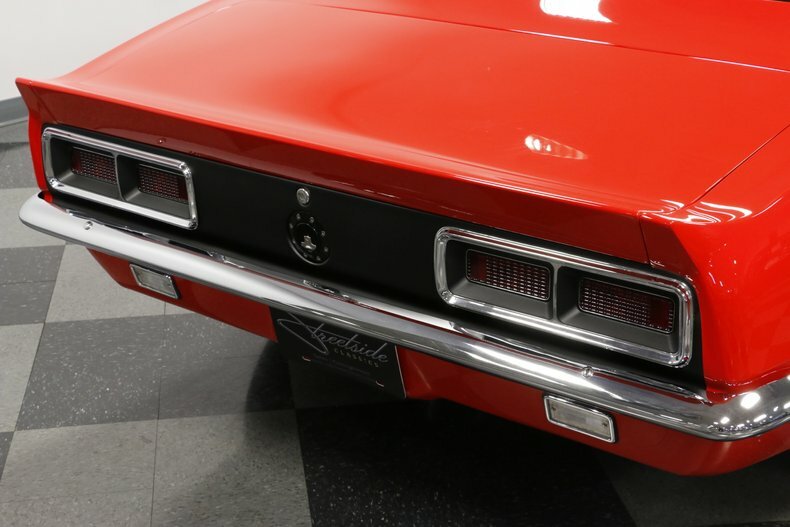 Even the iconic full-width spoiler was custom-built into the design. 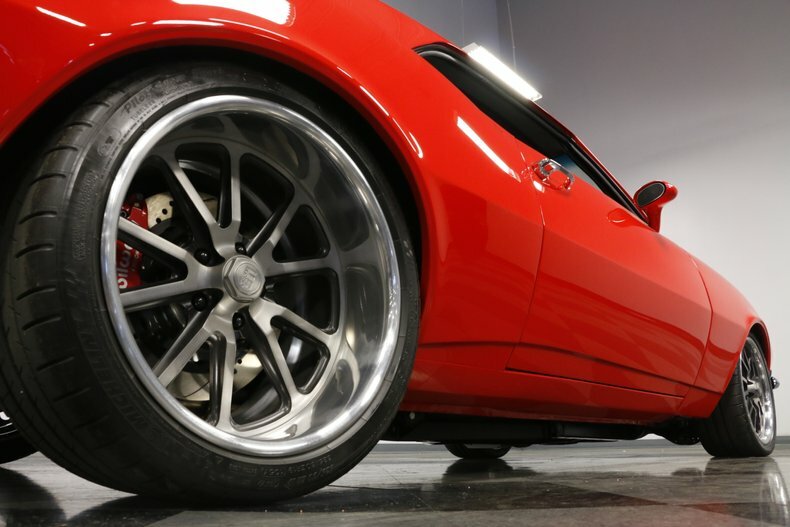 It's one sleek machine, and so it deserves a butter-smooth paint job. 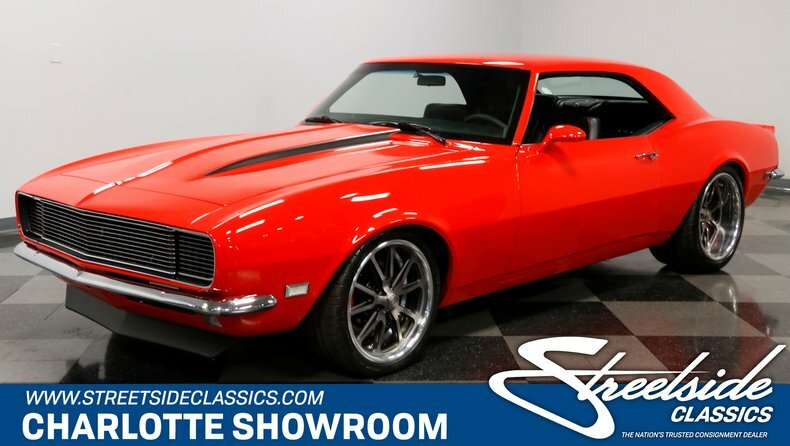 That's why the modern red went on with such a professional had that you'll swear this coupe is candy-coated. 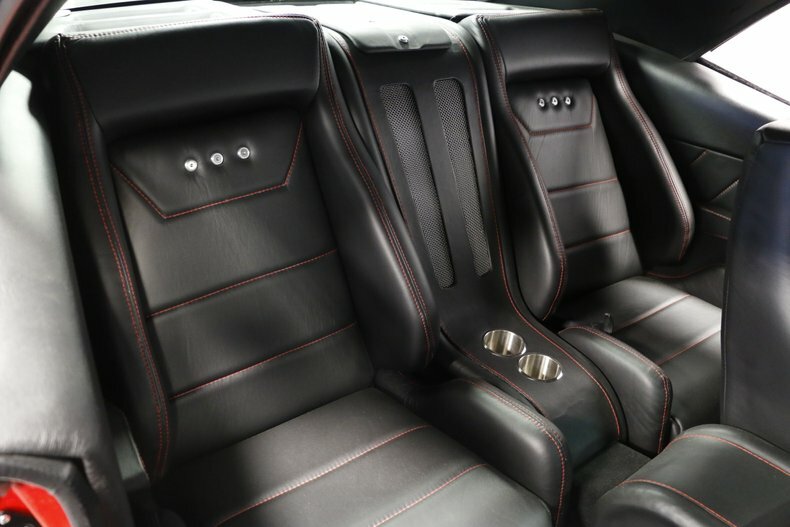 And because there's less than 50 miles on the whole build, you really get to enjoy the investments made. 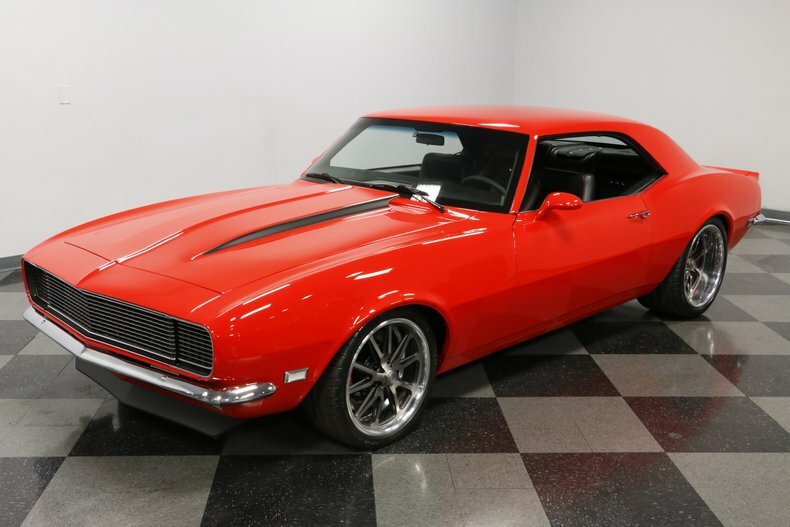 But while this red looks aggressive, you'll also love this coupe's darker side. 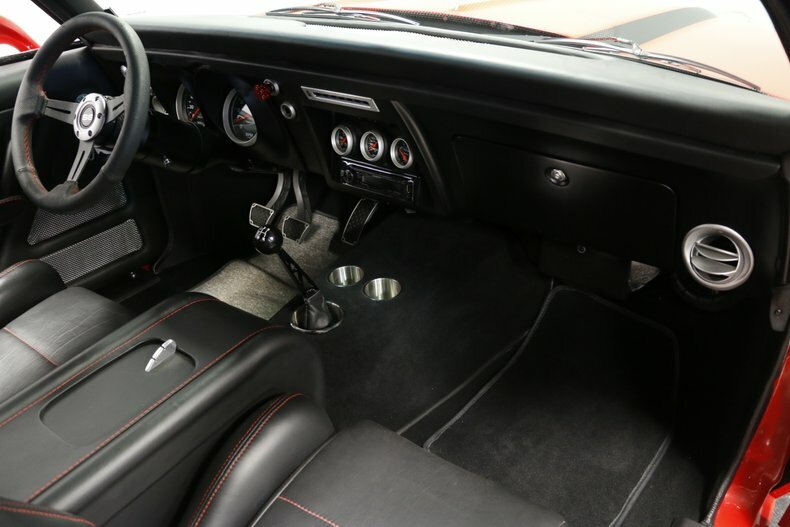 You see it in the custom grille with the Rally Sport's hidden headlights, low front air dam, blacked-out rear panel, and the custom cowl hood with a power bulge that's highlighted in black. 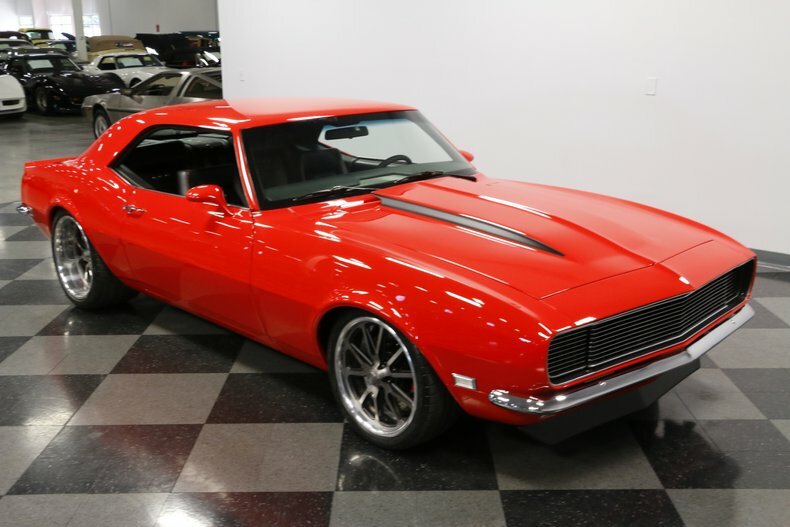 It's a total package that's both slick and intimidating all in the first glance. 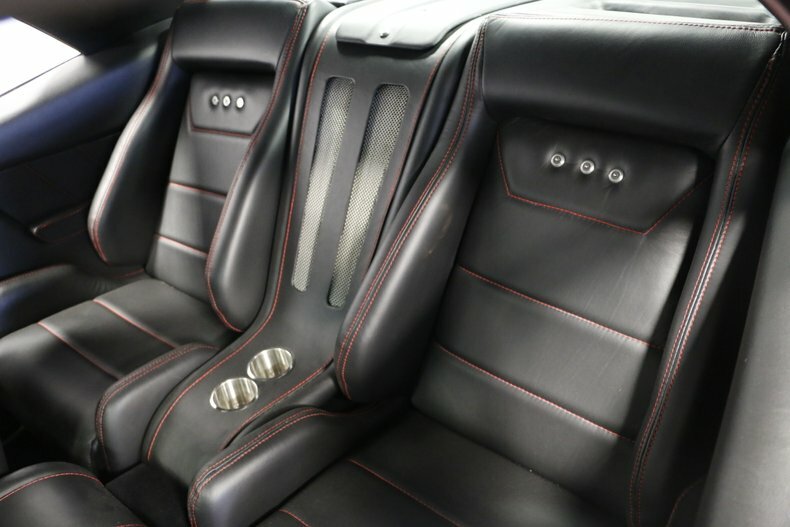 Inside, one of the first things you'll notice are the seats. 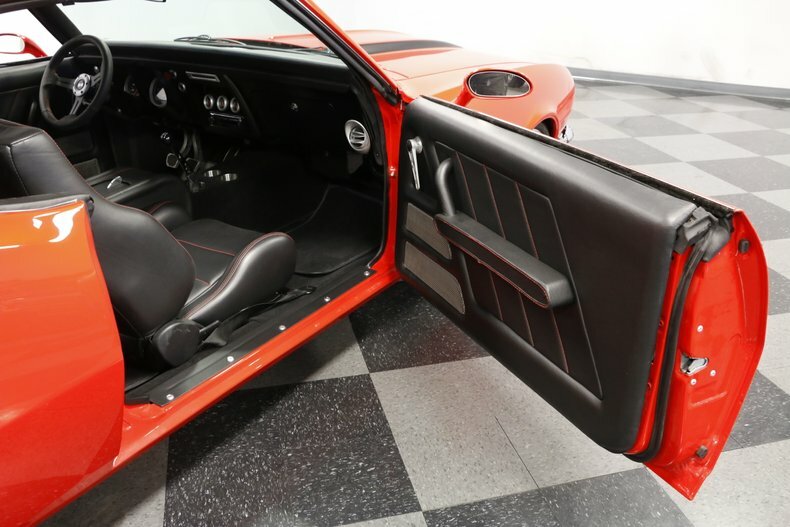 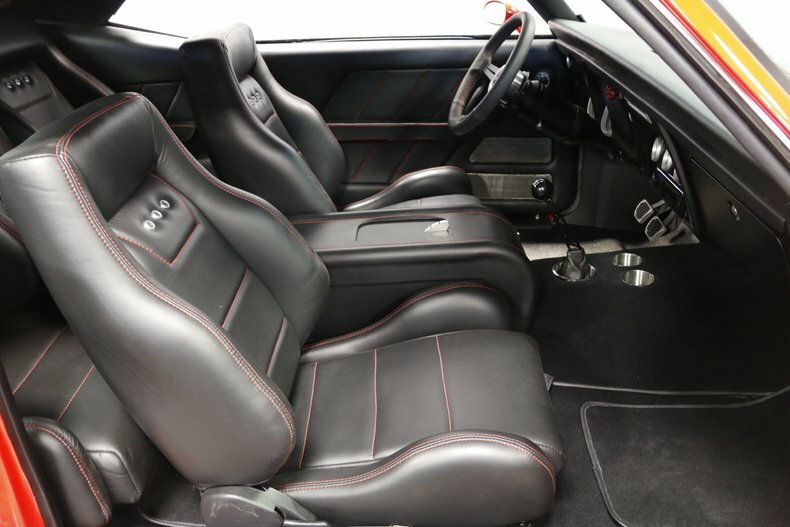 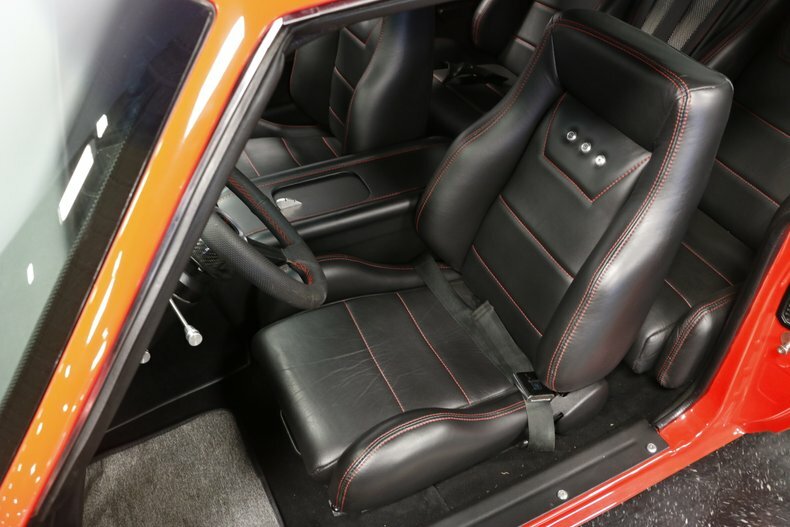 You instantly recognize these as modern performance seats with modern bolstering. 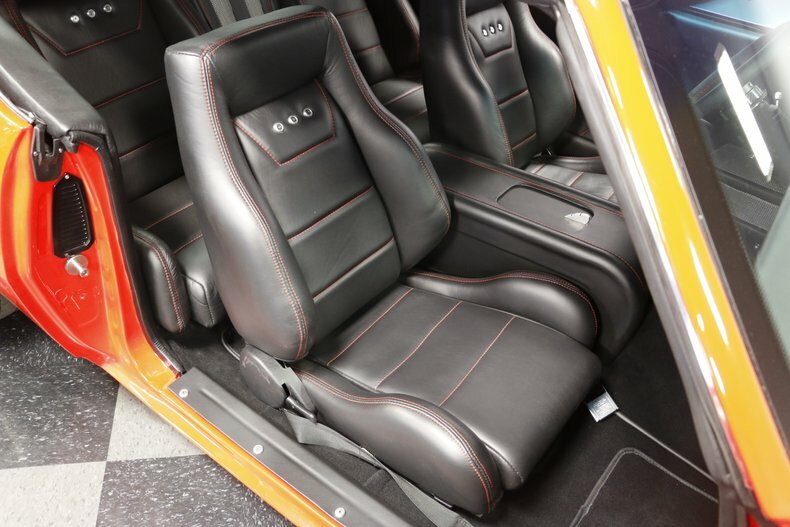 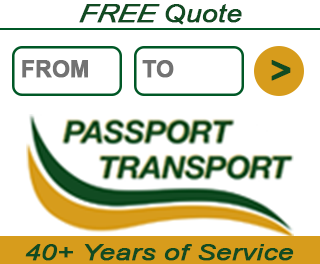 This is not only for you, but also all passengers - front and rear. 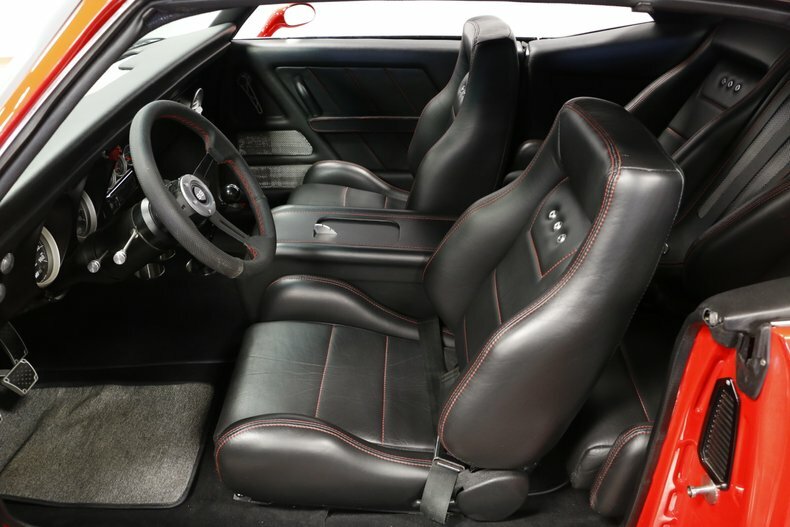 The black leather is supple, and the red stitching is the kind of detail that you expect from a top-quality build like this. 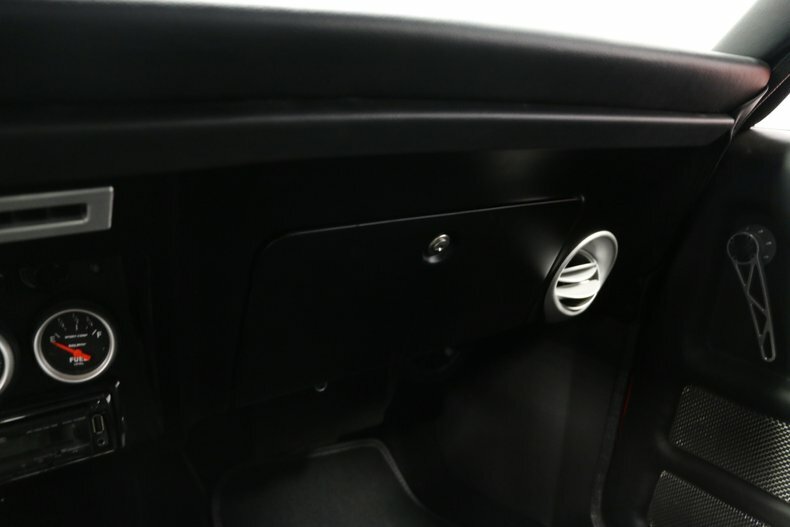 Plus, everyone gets a nice center console with welcomed cup holders in between. 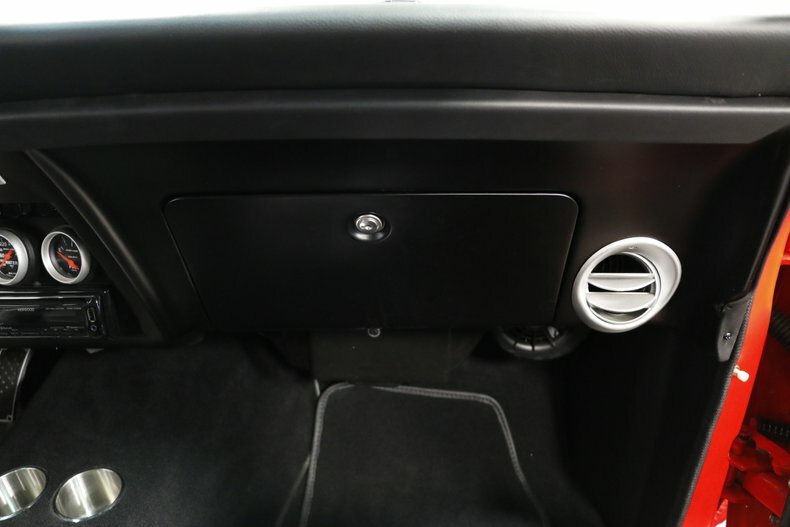 When your arm is not resting on the padded console, it will instantly be attracted to the Clayton shifter. 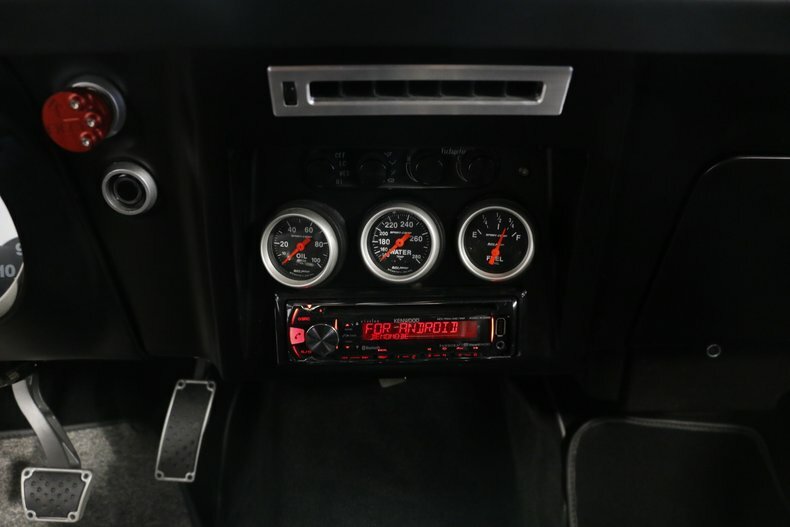 Just ahead of that is an AM/FM/CD stereo with modern USB and Bluetooth connections. 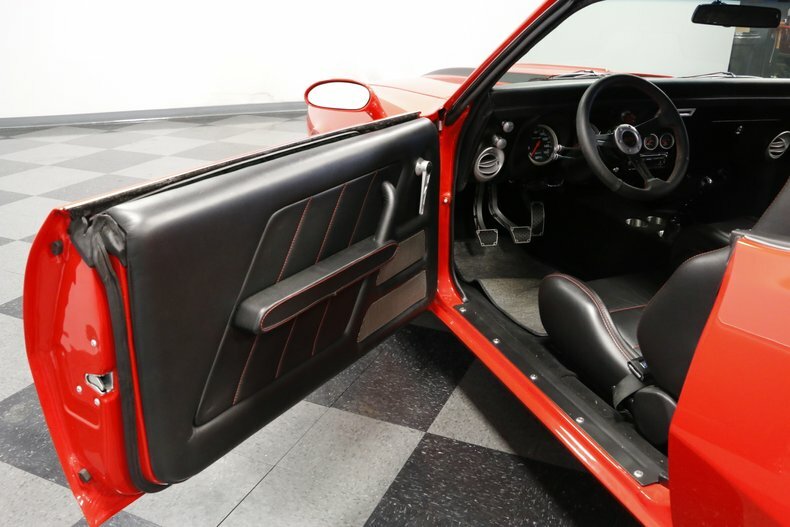 Plus, there's more great luxury items like modern R-134a air conditioning, power windows, power locks, power steering, and a push-button start. 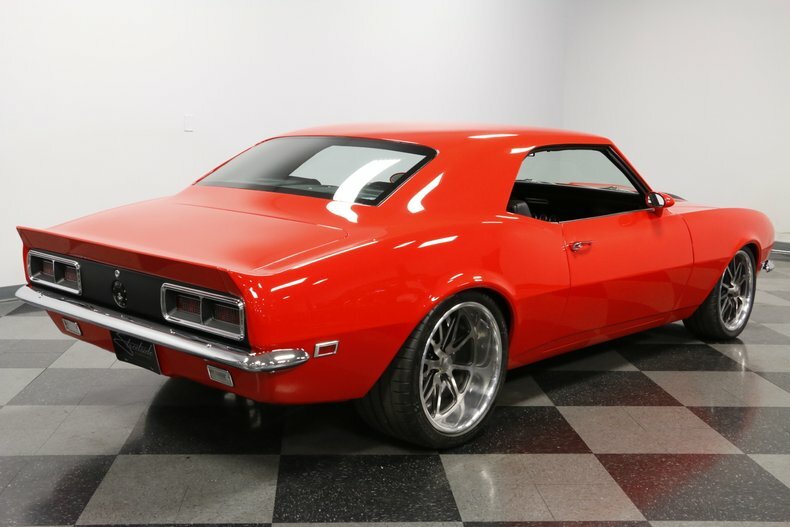 But more than just a coddler, this is a true performance machine. 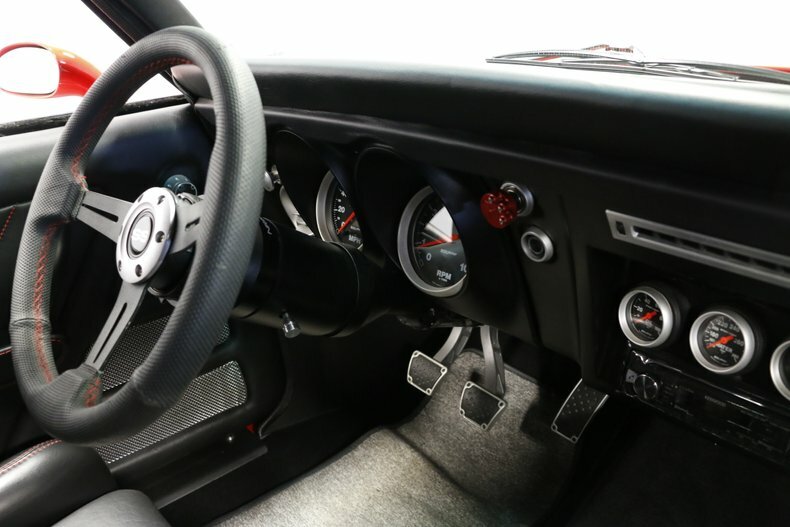 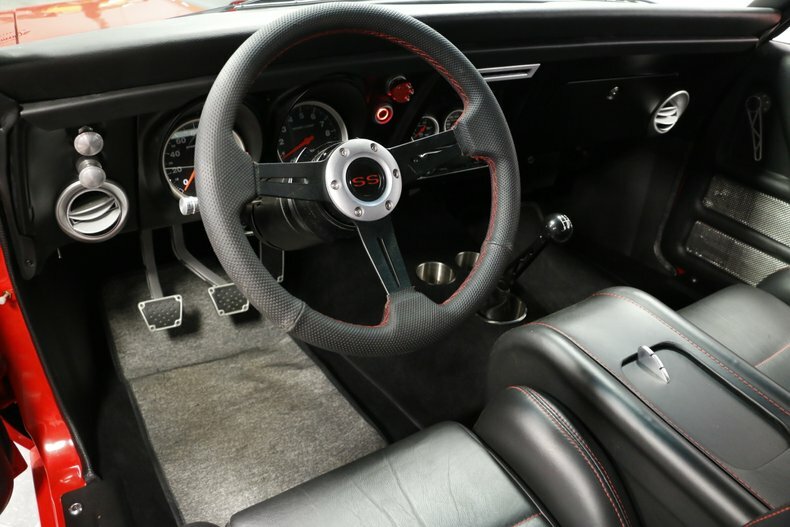 You slip behind a NRG sports steering wheel mounted on an Ididit tilt steering column. 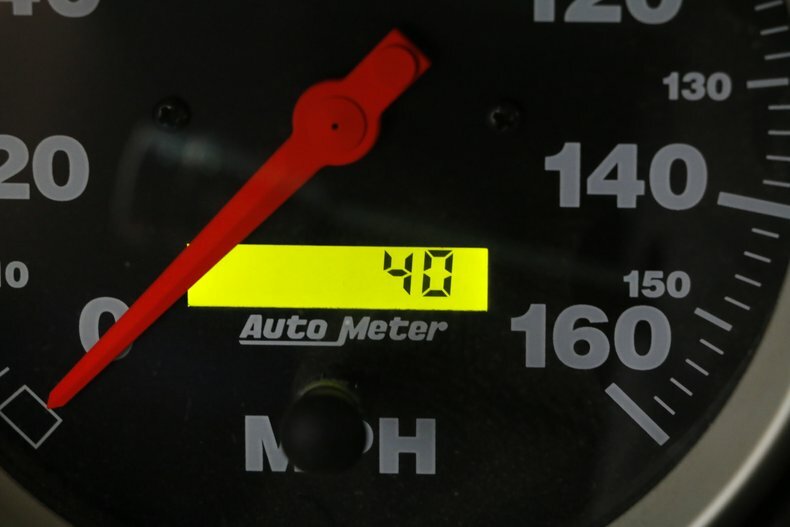 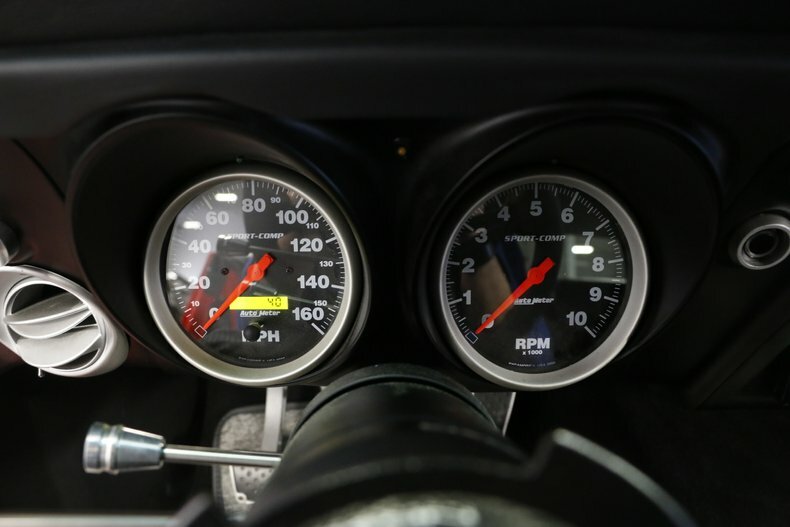 Beyond that is a large AutoMeter speedo and tach, and to the side is a full auxiliary gauge trio. 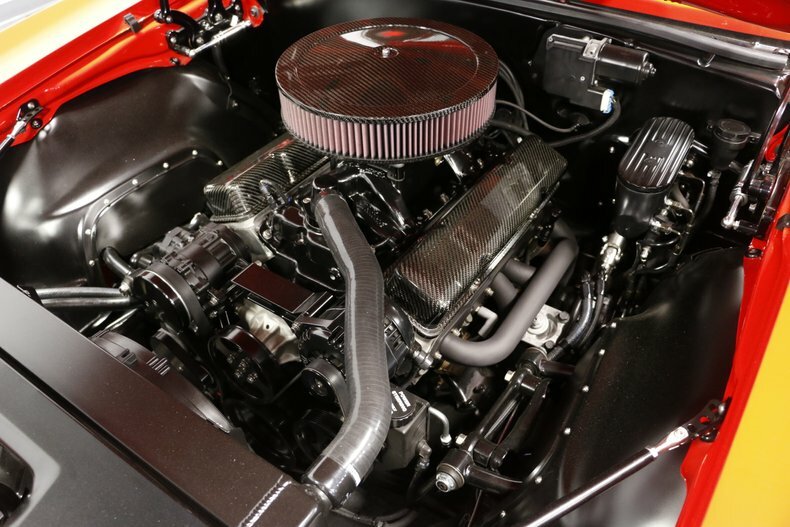 All this lets you know there's something serious under the hood even before you fire it up and hear it roar. 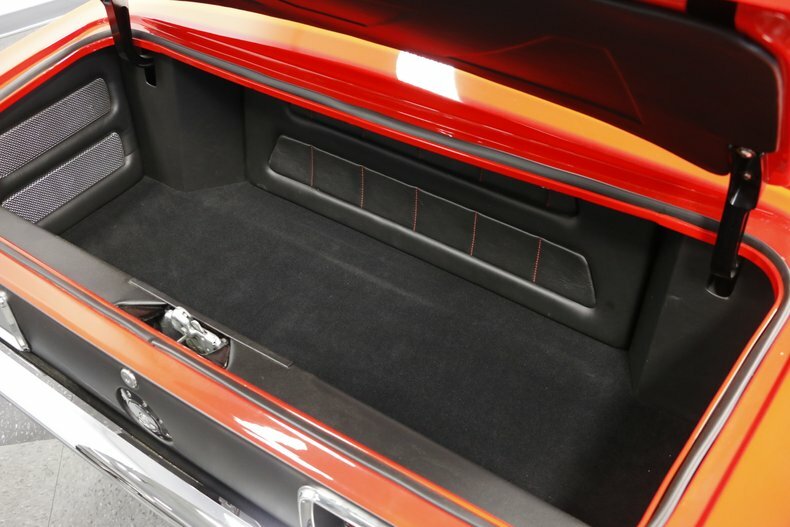 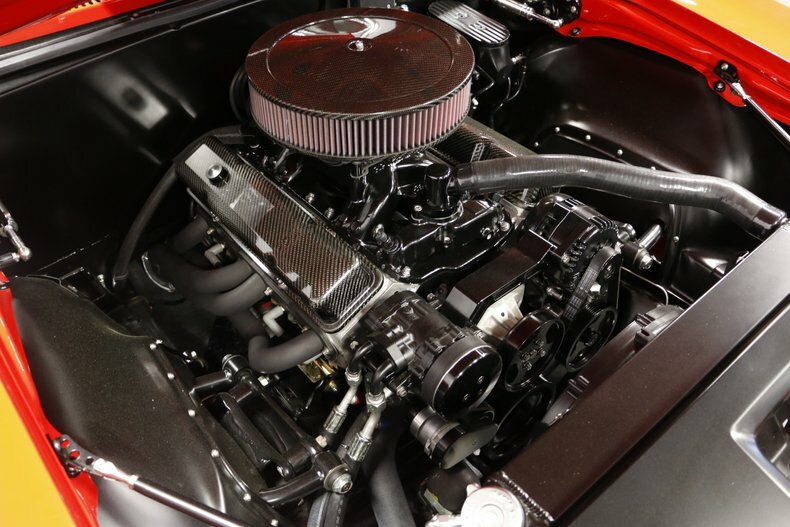 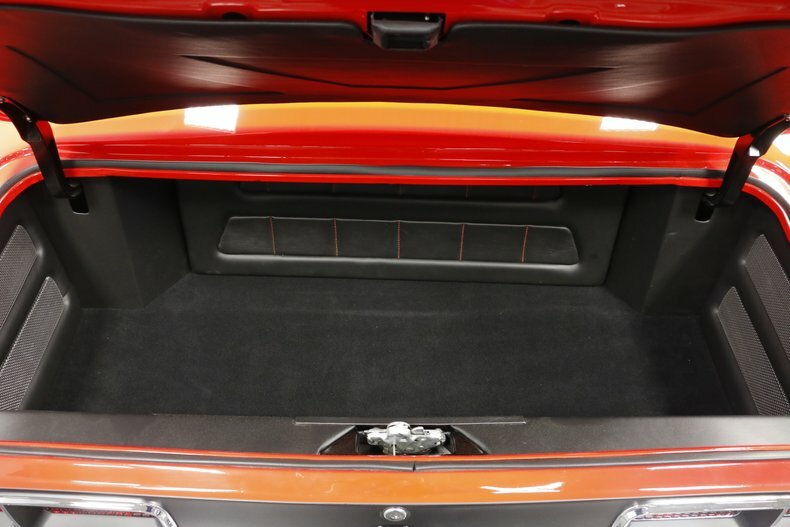 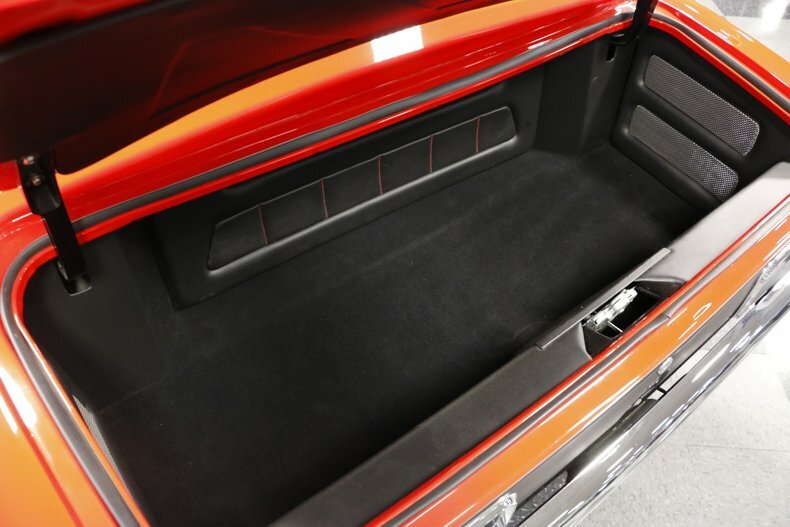 While many motors are chromed, this modern classic goes for the full blackout treatment in the very tidy engine bay. 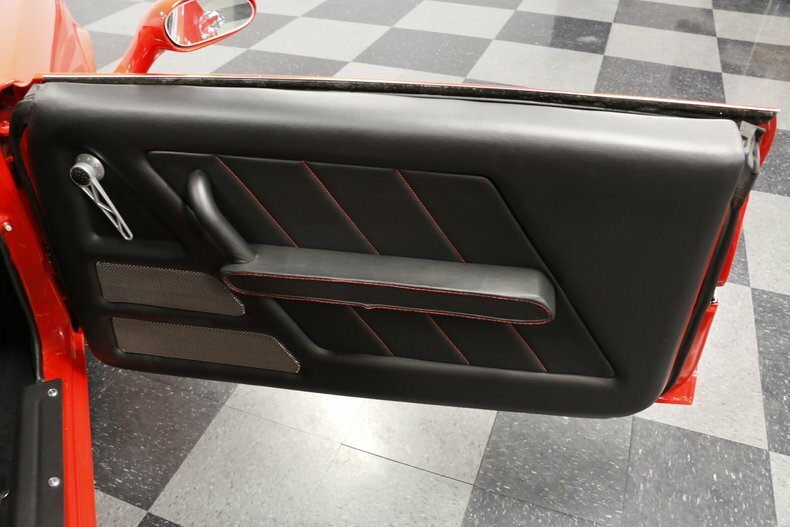 This includes great modern touches like the carbon fiber air topper and matching valve covers. 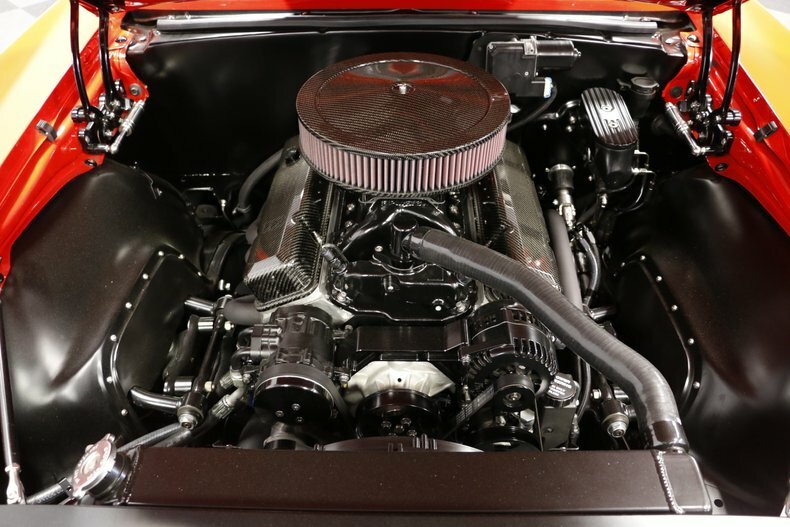 More than just look modern, this 383 cubic-inch stroker V8 features modern performance pieces like the MSD Atomic electronic fuel injection, MSD ignition, and serpentine belt system. 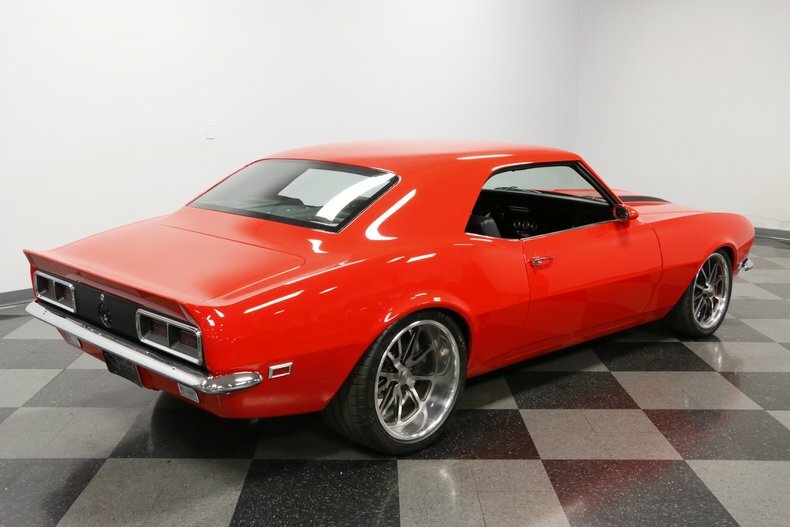 Other great upgrades include 3.75 steel crank, 10:1 compression, Pro-Comp CNC aluminum heads, Comp Cams 280 CFI roller camshaft, and Edelbrock Air Gap intake. 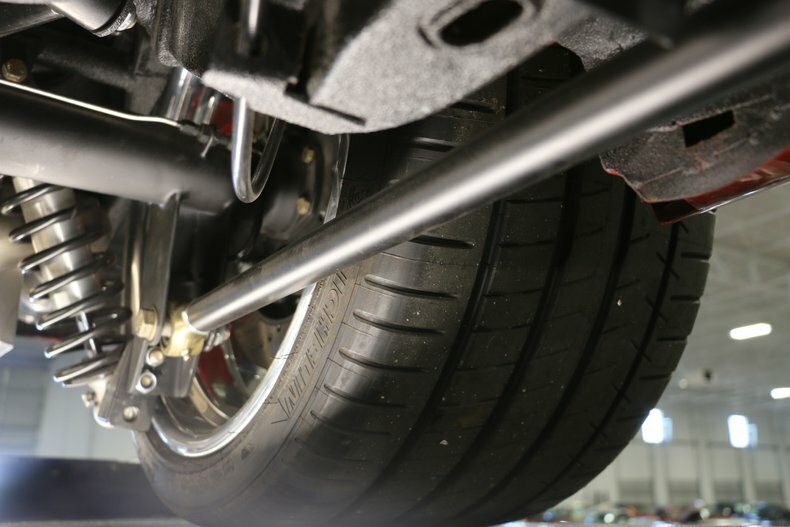 Plus, Hedman shorty headers add even more power as they also contribute to the rumble of the Pypes X-pipe dual exhaust. 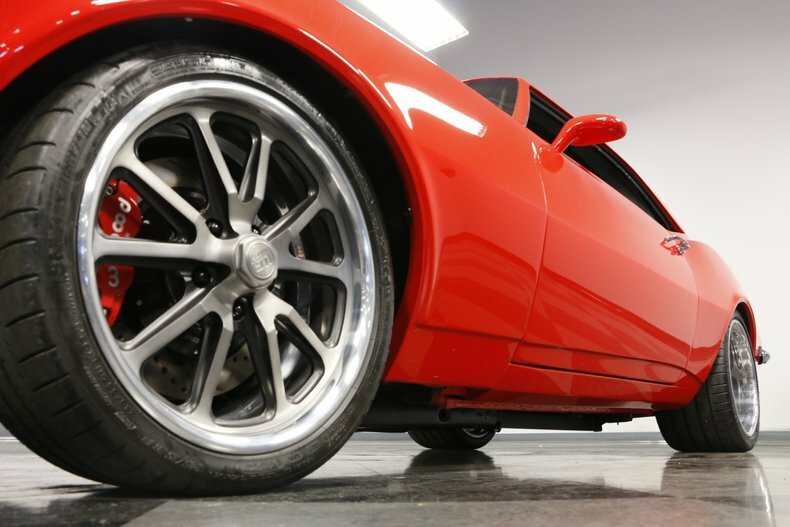 The enhanced V8 is mated to a TKO 600 five-speed manual to give you full control over the big power and its thunderous soundtrack. 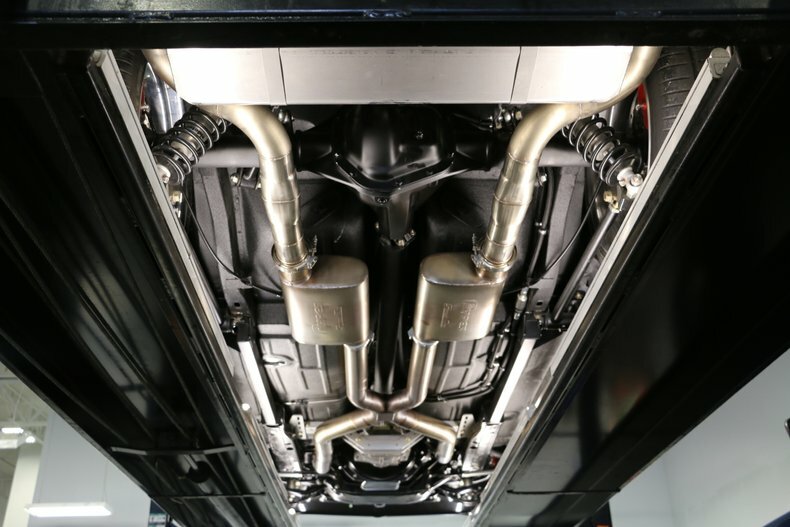 This connects to a stout Strange S60 rear end with limited-slip and 3.73 ratio for great takeoffs. 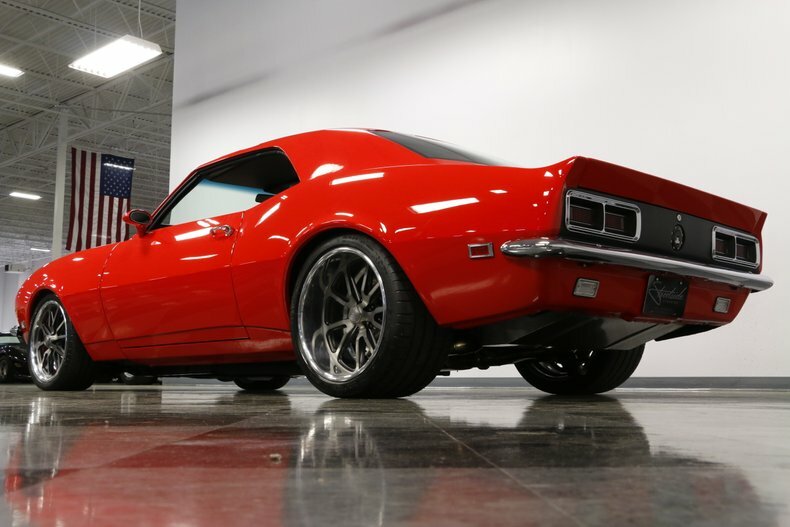 And more than just getting off the line, this one is an all-around performer with suspension upgrades like a Ridetech front subframe with tubular A-arms and adjustable coilovers. 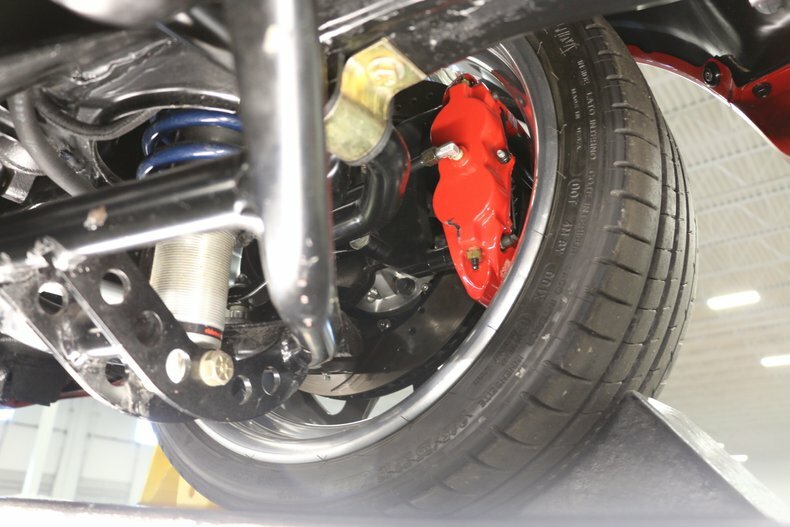 The rear is upgraded to a four-link with adjustable coilovers. 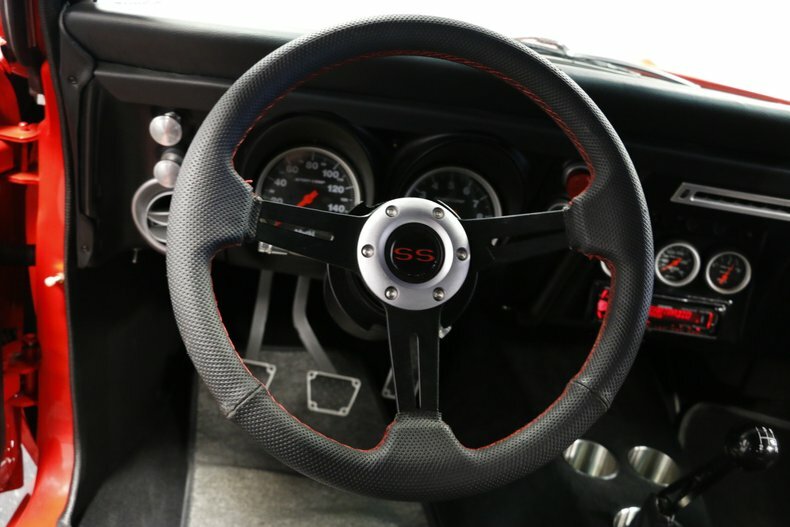 Plus, you've got the superior control with the large full Wilwood four-wheel disc brake package and ultra-grippy (and expensive) Michelin Pilot Super Sport tires. 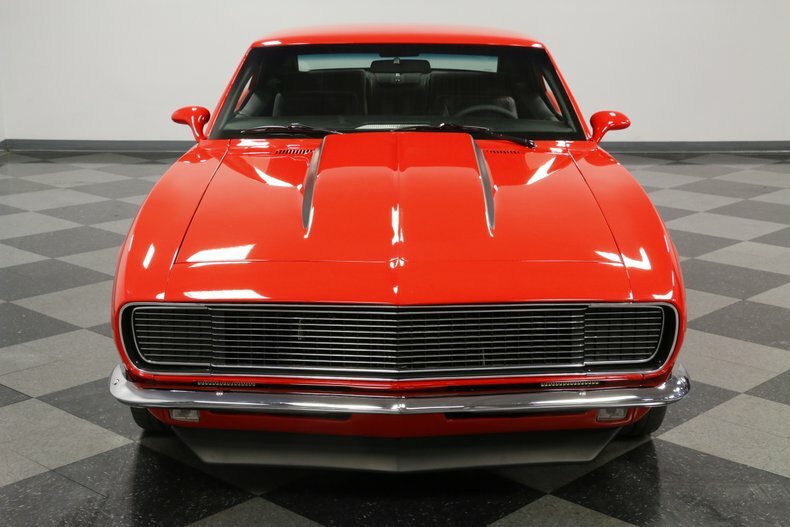 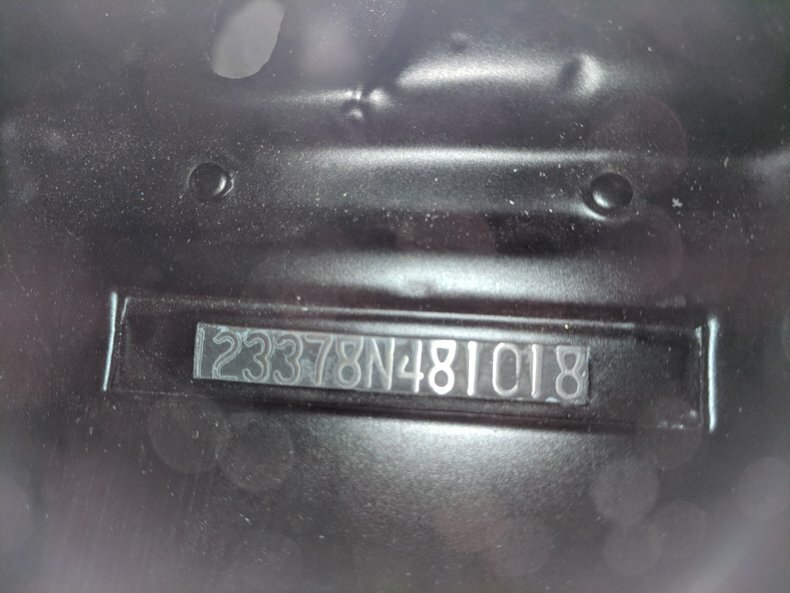 This is the prestige of a first-generation Camaro in a street-eating package that has the kind of comfort and control to leave you wanting for nothing. 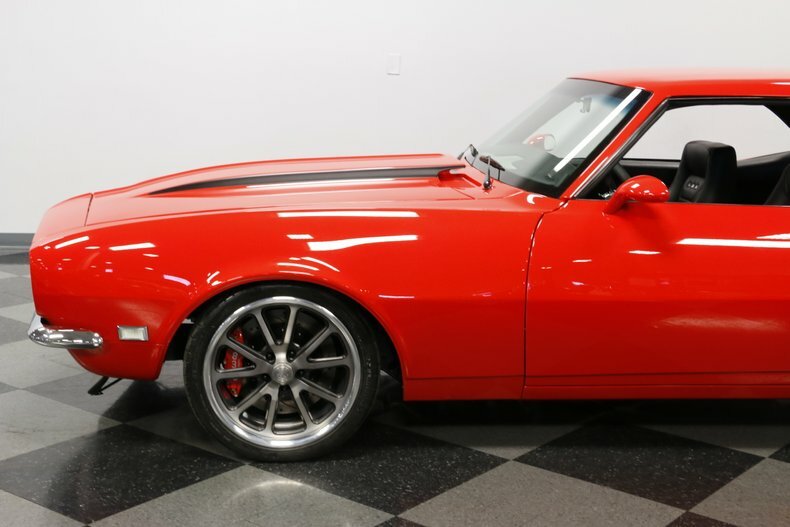 It's a thorough custom build, and we have the receipts to prove it. 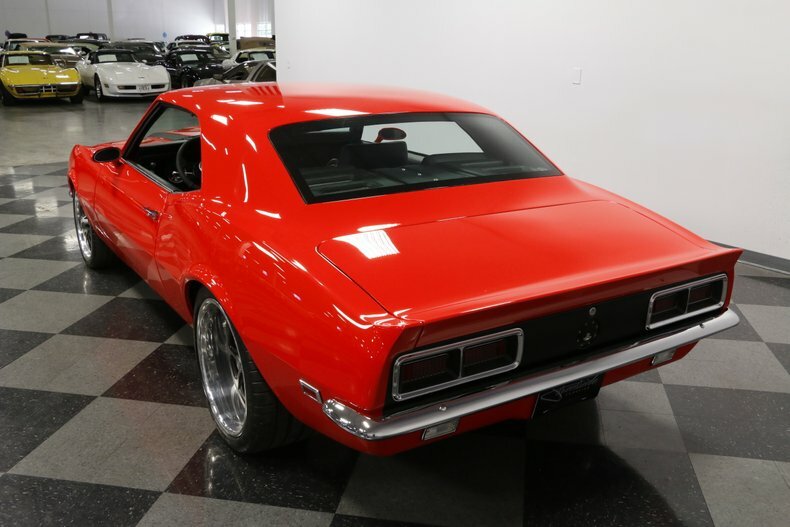 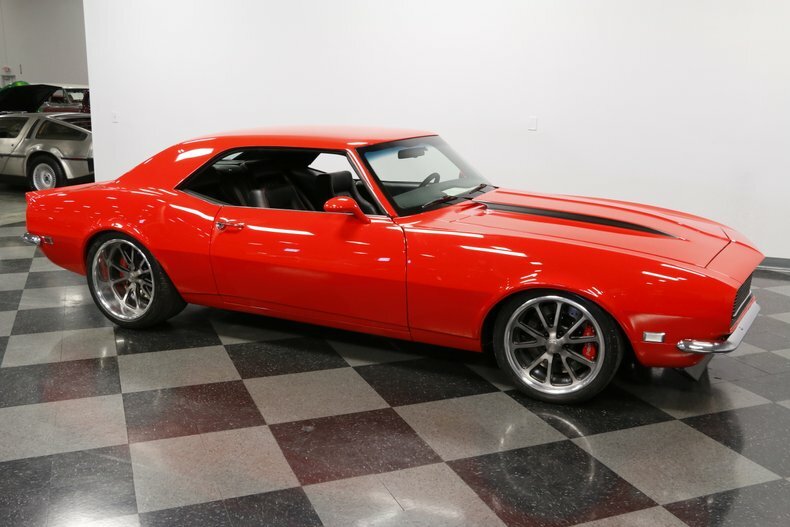 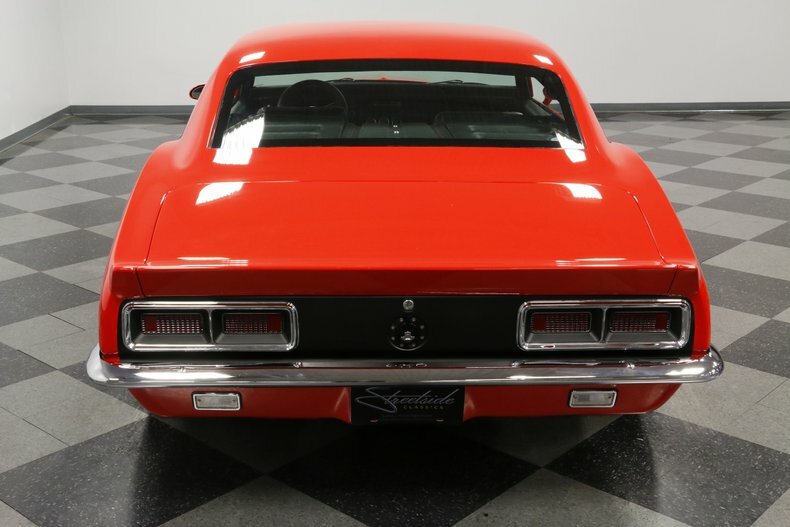 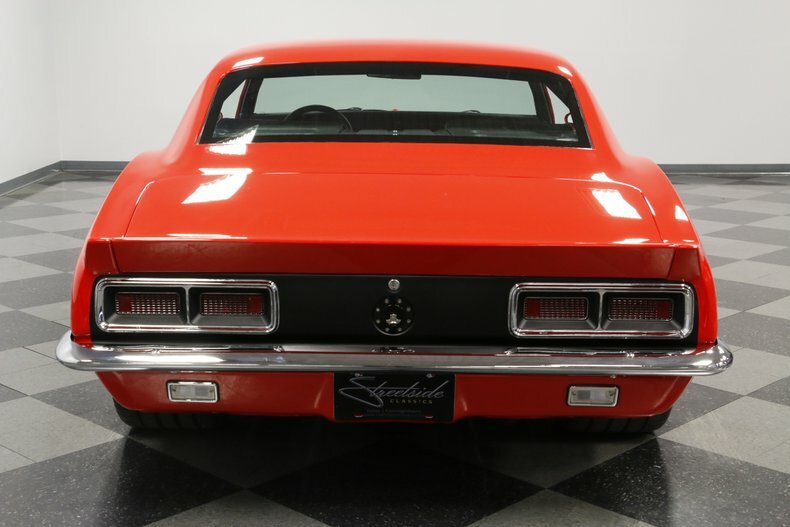 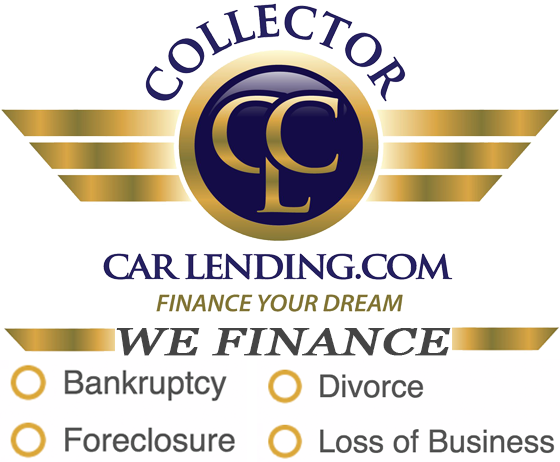 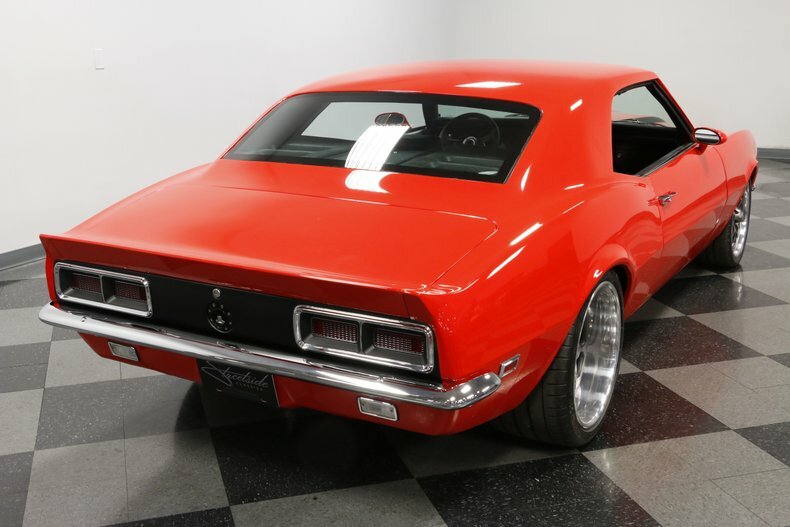 Here's a vintage muscle car that does everything, including leave our showroom quickly, so you better call today!